SAN DIEGO — Following nearly twenty five years of litigation in the courts, a federal judge appointed by George W. Bush has ordered that a historic war memorial cross be torn down as an unconstitutional government endorsement of Christianity. 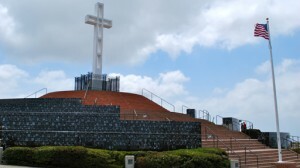 As previously reported, the Mount Soledad war memorial cross was erected near San Diego, California in 1954 and has been at the center of controversy surrounding whether or not its presence is legal, since the religious memorial is owned by the government. The American Civil Liberties Union (ACLU) has been fighting against the cross for years on behalf of atheist war veteran Philip Paulson. In 2011, the 9th Circuit Court of Appeals ruled that the display was unconstitutional as it violates the Establishment Clause of the First Amendment. The decision was then appealed to the U.S. Supreme Court, but the case was rejected for review. However, Justice Samuel Alito stated that the court may wish to hear the matter after the local district court rules on the ultimate fate of the cross. On Thursday, U.S. District Judge Larry Burns, nominated by then-president George W. Bush in 2003, stated that he had no other choice but to follow the 9th Circuit’s opinion and declare the cross unconstitutional. “In spite of many secular changes to the memorial, its long sectarian history, as found by the 9th Circuit, effectively prevents the government from purging the religious connotation in any other way,” Burns wrote. He ordered the cross to be removed within 90 days, but stayed the order pending appeal. But the American Center for Law and Justice (ACLJ), which had filed an amicus brief on behalf of 18 members of Congress who want to save the cross, says that it will continue fighting. The case could now make its way back to the Supreme Court.